Volume one in the Flower Power Series. After an experience of coming near to death and being left hardly able to walk, this became a most sobering period of my life, without question. As a result of my caution and the possibility of another crippling fall, I retreated from so many of my favorite haunts and focused on the written word, which I more easily control, for I am the master of the lyric voice, and I never needed it so much, after I lay sprawled, concussed, isolated, and in despair. One day, a few months ago, I finally decided to test my abilities by reverting to some of my usual habits and dispositions. I seized my cane, took the elevator to the ground floor, and resolved I would walk to the Sheraton Commander Hotel for breakfast, as I so usually used to do. It is only a few short blocks from my residence, and I so often enjoyed noting the progress of the plants, while enjoying the plethora of various weathers, a particular joy and consternation in New England. Yes, I loved to check the progress of the fast emerging flowers along my way, progress I never failed to note. It was always good to see them. But this time I had to stop at every step and place my foot just so, so I would not fall; pausing to ascertain my progress, my hands secure on the guardrail, my feet awkwardly arranged on the steps. I moved slowly, deliberately, unsure yet certain I must do this, or never walk again. I paused outside my residence, trying to convince myself that I could not proceed, that I was not ready to proceed, that I dare not proceed, for fear of all that could transpire. 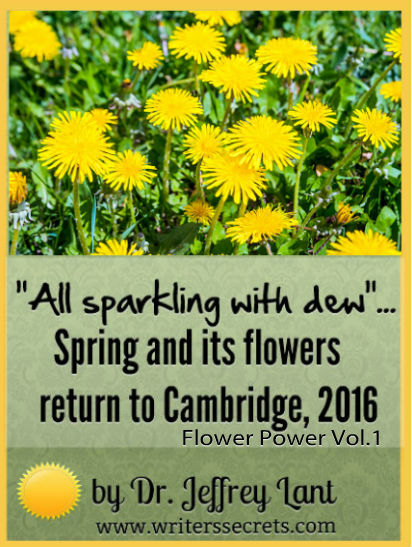 Then there it was, nestled against the brick pavement, a dandelion, its bright yellow arresting my attention, the first I had seen this year. I faltered just a bit, and then, in the most courageous thing I have ever done, I took one step towards my destination, and resolved that come what may I would walk out this day, and exchange greetings with the world, which had missed me, as I had missed it. I made my destination and had shown myself and the world what I might still do with the help of a dandelion, which winked at me as I ambled home, and said, “Godspeed, Your Excellency, now you know what you can do. That is a very good thing to know.” This is the power of flowers, and I had known it all my life. The flowers of springtime in New England are the happiest and most welcome flowers of all. They confirm, you see, the bitter winter with its arctic winds, and its blizzards that stab you on their way are gone, gone, all aspects of the frigid and disconsolate past, gone. Now, is our patience, our tenacious patience, rewarded by a beauty that asks for nothing more than cheerful recognition and acknowledgement. This book, in three chapters, celebrates some of this needed beauty, thereby lightening your burden. 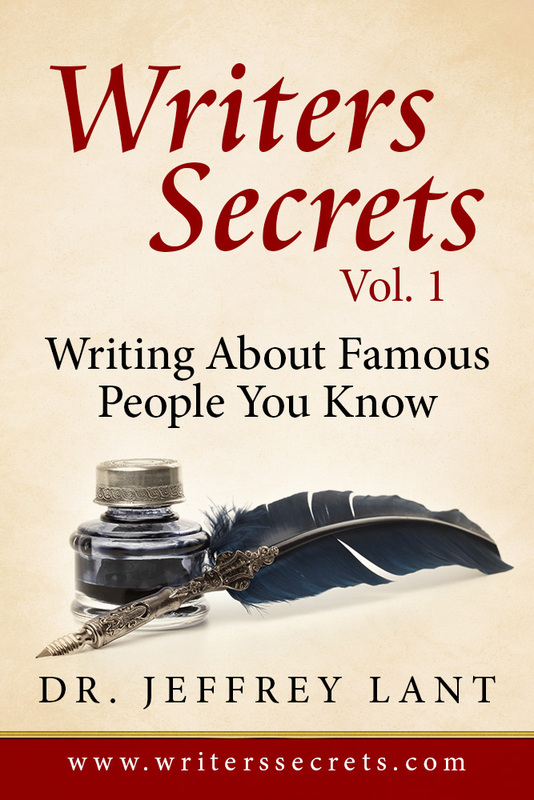 It is with the greatest possible enthusiasm, even glee, that I open this first volume of my new series from Writers Secrets. This series has been developing for a very long time, for over fifty years in fact. I have not only written, but have helped thousands of people worldwide to write, too. However, today, I take you to a whole new level. Never done before, I will show you how to master every aspect of writing so that you will know what to do, when to do it, how to do it. And, I will give you helpful models so you can see how I do it. In no educational institution with which I am familiar can you learn every essential point of what it takes to be a successful, that is to say, a money-making writer. Hitherto educators in the field of writing have simply said “To be a writer, one must write.” This fatuous advice is neither useful nor productive. One needs to know more, and more again about writing before showing that writing to anyone. Once you’ve read the volumes in this series, you will be amongst the elite of the Earth, because good writers get all the goodies, name recognition, esteem, veneration, and, of course, money. For let us never forget, that “None but a blockhead writes but for money” (Dr. Samuel Johnson, 1709-1784, inventor of the first English language dictionary). I am tired of meeting people, particularly young people, who have been given that useless advice… to be a writer, one must write. In these pages, I shall show you the verities of writing, and the facts which will advance you… or, should you fail to use them, destroy any chance of your success. instruction you may have had, you will find yourself awash in trophies… including fame, notoriety, affection, appreciation, awe, recognition, honor, and certain reverence. For all these, and so many other benefits, can and must be yours, if you will but understand the structure of successful writing, and work for a lifetime to perfect your skills. You see, the world loves writers, and I, therefore, love the world. For so many years now that I cannot even remember, writing has been my unstoppable rocket, matched by nothing else. You say, upon being asked, “What do you do for a living?” The response launches the beneficial process… “I am a writer.” And by that we mean superior, intelligent, clever, shrewd, inventive, creative, and for the nonce, charming to a degree no average mortal can even wish for, much less attain. I shall be attending you every inch of this fabulous journey. For now you have an advisor of note, dexterity, inventiveness, truth, and may I say it, love. For seeing you advance will be one of the glories of my life. And I shall say as I see you rise, “This one came from me!” Be that one. access and commendable results from any famous person in the universe. 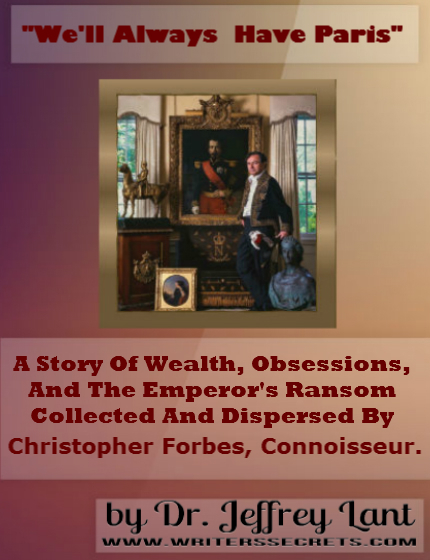 Lifestyle Books > “We’ll always have Paris.”: A story of wealth, obsessions, and the emperor’s ransom collected and dispersed by Christopher Forbes, connoisseur. “We’ll always have Paris.”: A story of wealth, obsessions, and the emperor’s ransom collected and dispersed by Christopher Forbes, connoisseur. and what happened that memorable day? I do. many items selling for two bits it was adequate. Adequate. careless; while less might have killed my ambition and motivation. But “adequate” was just right. smothering an old and dear friend. Storage, an act of love. indiscretion and memories for a lifetime. la France” he meant it, and he had done everything to make it happen. Now it’s time to take the voyage and see the treasures built up for over fifty years, now dispersed. There was something lurid about this place of the dead. And then we saw it. On an overturned tombstone, bright with creepers, this message: “Not Dead But Sleepeth”. At once, we felt sure that that was a message for us to retire as quickly as possible back to the haunts of man, who craves the congregation of our still quick neighbors. I have never forgotten that day, the haunted aspect, the omnivorous plants, the overturned tombstones, and the frightful possibilities which we saw clearly might emanate from such a place where death stands forth each Halloween and the aspect for all is frightening. This is Halloween, and this, my book, is composed of stories that make it all explicable. Halloween is an acknowledgment that evil exists, and that evil is daily in confrontation with God and the Cosmos. Thus, each All Hallows’ Eve, October 31st, the door to Hell swings open on rusty hinges releasing a terrible smell of burning flesh and brimstone, Prince Lucifer’s luxurious perfume. The doors to Hell swing open, bit by bit releasing the unlimited number of sad and woebegone creatures packed within 364 days a year, and released to carry on their noxious work. It must be done before midnight of the next day. And so smart people stay locked behind closed shutters, holding hands, singing psalms, and praying to God Almighty for relief, mercy, and absolution. For if the Devil is around this night, God is surely around as well. All Hallows’ Eve, most fervently celebrated by the Celtic peoples of Europe, is an indication that the great war between good and evil, between God and the Devil, is not finished yet. God ascends in triumph for all but 24 hours of the year. In these 24 hours, every transgression, every sin, every malevolence, is not only imaginable, but visiting your neighborhood to see who could be wooed to attend the macabre dances of Prince Lucifer, where burning flesh is the prevalent scent, because fire is the prevalent instrument. We of course wish to think nothing on this terrible event which comes to call so many, and returns no one at all. Their motto: “Not Dead, But Sleepeth”. And they wake up with a vengeance and a purpose on All Hallows’ Eve. This book offers five Halloween tales, each of which is intended to take you into this curious holiday, where the real meaning has been filtered out, leaving nothing besides sugar and delusion. We start with the way Halloween was when I was growing up as a boy in Illinois, 60 years ago and more. In my role as a cultural historian, writer of many articles and books about human behavior and its various manifestations, I felt it my bounden duty to publish this story and show you what Halloween was like in bygone America. The next tale deals with Ichabod Crane, a famous American character from Washington Irving and the Hudson Valley School of Literature. It makes Halloween come alive, although most of it is actually dead. The next article deals with the quintessential Halloween fruit (yes, fruit), pumpkins. This tale takes you deep into the whys and wherefores of pumpkins, which come into this world with a clear objective: to frighten us to death when they are turned by deft carving into jack-o-lanterns, the fruit of our bizarre imaginations, and the pumpkins’ ability to portray them. Kicking a pumpkin to death is technically akin to “Get thee behind me, Satan”. Thus, those vandals who disrupt our coy holiday motifs may actually be doing God’s work. It’s a thought. One aspect of Halloween which we wish not to consider is the matter of witches and their related colleagues in the black arts. We do not wish to believe what our ancestors so fervently believed… that witches are certainly here, that they communicate with the Devil, and are the handmaidens of his dark hours and purposes. Think for a moment, of who benefits from the candy avalanche in your neighborhood. Dentists cheer. Candy companies hold riotous parties on Halloween night, when profits zoom. People making flimsy costumes that mock evil, and make it seem it is a matter of children, when in fact it is a life or death matter for everyone. So candy sweetens the brimstone, and perfumes the fire of flesh. Oh yes, I forgot to tell you… the Devil owns 100% of the stock in every chocolate and candy company around the world. He sells the costumes. He even charters the dentists, whose enamels are so easily chipped by the excessive intake of fructose. So who is the Number One beneficiary of All Hallows’ Eve? Prince Lucifer. Remember, Lucifer was God’s right hand man before he was banished from Heaven, and he left with every skill he ever had, including making sure that no one is really frightened by his works, when in point of fact, they should be on their knees begging for mercy. You see, Lucifer is a clever public relations executive. He wants maximum dollars for minimum work… a true entrepreneur. If he came out and ordered his gruesome minions to frighten the entire population, he would not be able to maintain his comfortable, lucrative occupation. Who sweetens the candy? Lucifer. Who designs the fetching wrappers, which catch your eye? Lucifer. Who puts the children on the streets to collar as much deleterious sweetness as quickly as possible? Lucifer, of course. So now today, I tell you this: this is Lucifer’s day, and whatever you do, look carefully at every label. His expansive inventiveness will be apparent in everything pertaining to this long-standing tradition called All Hallows’ Eve, Halloween. And when the crevice in the Earth, which opened to release the ghouls, begins to close on rusty hinges, you may be sure that all the loot that Satan has cleverly amassed in such a short time is on its way to its final destination… the bottomless coffers of Prince Lucifer. “Our God, our help in ages past, Our hope for years to come” (from the hymn “Our God, Our Help in Ages Past ” by Isaac Watts. 1719). This version is performed by Westminster Abbey. TAKE THE HIT… IT MAY WELL BE THE ONE THING YOU NEED TO SURGE IN YOUR CAREER. The boss doesn’t like you. You are a corporate blabbermouth. You are always pestering the boss for a raise. You come and go like the wind to suit yourself, never being able to make the deadlines required. You’re inclined to mouth off, when “mouth in” would make a hell of a lot more sense. Your cubicle in the office is so dirty, rats exclaim “Eureka!” when they arrive after you’ve gone home. Oh yeah, there are plenty of excuses that are holding you back. But one, if you absorb, will move you ahead like a space rocket. That is… take the hit. The first rule of life within a corporation or other business entity is that the leadership must be allowed to lead. And as sure as God made little green apples, when they lead they are going to make mistakes. I want to tell you a whopper mistake that almost blew up the nuclear bomb. That was the run up to the Bay of Pigs fiasco in 1972. It has been my horror to review the private records of President Kennedy and Attorney General Robert Kennedy. These boys were scared. Let me give a for instance. The archival papers are filled with one ongoing theme: the demand of the Kennedy brothers to the Army, Navy, Air Force, and Cuban revolutionaries that none of them tripwire the operation and let the genie out of the bottle, rather making sure that no one in and around the White House could possibly be blamed should anything go wrong. But of course, nothing ever would, right? Mama mia! Now think for a second about what was going on. You had military personnel being told they’d blow the whole operation should any part of it become public. Well let me ask you something. Mr. Reader. If someone asked you whether a bunch of warriors could get from the Caribbean or Florida to Cuba and keep it all quiet, this is what you’d say… “Orville, that is downright the stupidest thing I’ve ever heard. You can’t keep these people under wraps with duct tape on their mouths.” In other words, plausible deniability was the stupidest assumption the President of these United States ever made. And so, when the Bay of Pigs fiasco blew up with everyone and their brother predicting the end of the world through just one tidy A-Bomb or two, Kennedy acted. Not to clear the decks, not to tell the truth, not to make up with Khrushchev (kiss kiss), but CYA. And the poor schlepper he dumped on was Adlai E. Stevenson (1900-1965), Ambassador to the United Nations. Stevenson was in a bad place. The President was telling him the United States was not involved in this Bayside fiasco, but Stevenson was hearing from everyone and their brother that not only were we involved, we were leading the parade. What’s a body to do? Find a dodo, and drop the hit right square on his head, just the way Kennedy did with Stevenson, and the way Bush ‘41 did with General Colin Powell (maybe there’s something in the water down there at the United Nations; it certainly is unpleasant enough). I can very well imagine Stevenson’s plight in those days approaching Armageddon. On the one hand, he is told from the White House, “Don’t worry, we didn’t do anything”. And on the other hand, every information source that made itself available to him (he didn’t have to go far) told him that he was being lied to by his President, the President of the United States, liar. Kennedy and Stevenson didn’t get along as it was. Kennedy despised Stevenson, after all, he had been crushed in the 1952 presidental election by everybody’s favorite boy scout, Dwight David Eisenhower. And then if that wasn’t enough, he went and got himself crushed in the 1956 election by that same boy scout, the hero of Europe, and cute to boot. kept the waters roiling by pushing for Stevenson – again! Stevenson had no chance in 1960 (frankly, he didn’t have a chance at any time), but his candidacy signalled to the left wing of the Democratic party that they just couldn’t stomach Jack Kennedy on any terms. Now this is a moment tailor made to make everyone unhappy. Eleanor Roosevelt, the matriarch of the party, couldn’t stand Kennedy. Not only was he too young, but he didn’t revere Mother Roosevelt nearly as much as she thought he should. And as long as she was calling any shots on the left wing, and as long as she kept Adlai in the race, old man Kennedy and his brood lived in a state of barely supressed rage. Now you can imagine once they screwed up the invasion, how desperately they needed a scapegoat. That scapegoat had Adlai E. Stevenson written all over it. And now we come to his problem, and yours. President Kennedy realized that if he accepted responsibility for the Bay of Pigs invasion, his standing in the international community, not to mention rural America, would plummet. But since Adlai E. Stevenson was entirely disposable, the Kennedys kept him dangling on a string until they decided what was the best way of slitting his throat. Just this: Kennedy couldn’t afford to take the hit, and so he threw Adlai Stevenson to the crocodiles. Now this wouldn’t have been quite as bad as it was if Jack Kennedy had sweetened the pie just a little bit, and given Stevenson what he really wanted – to be Secretary of State. That would have involved kicking Dean Rusk out of Foggy Bottom, and giving him something like, say, the Ambassadorship to Trinidad. But Rusk was Kennedy’s boy, and Stevenson wasn’t. Therefore, Kennedy just forced him to take the hit, but gave him nothing for it but a Hallmark card that said “happy happy”. Of course in retrospect, Kennedy should have given Stevenson anything he wanted, as long as it didn’t involve Washington D.C. or Mrs. Roosevelt, for they all cordially hated each other by now. So what’s the lesson to be learned here, the one that can make or break your corporate career? Whenever possible, and whenever your boss has screwed up, let him know you’ll be glad to take the hit. Many corporate careers have been broken (or made) at this moment. Everybody knows the big boss makes mistakes, sometimes it’s some real whoppers like the Bay of Pigs, which almost wiped out the whole planet. But we all know that the big boss cannot take the hit, and so an alternative must be connived. Most people in most businesses spend a considerable amount of their time yapping about how lame and stupid the big boss really is. They may actually believe it, or they may just be saying so to pass the time of day and indicate that they are just an ordinary guy or gal. But you’re not ordinary. And that’s why at all times, you must be prepared to move with events, not just stand by and look at them happening. When the boss needs you don’t hide under your desk or stand on the sidelines kibitzing, go and proclaim to him that you are available to help right now… and then do so. Every leader in the world needs loyal followers. There is nothing more loyal than falling on your sword… so long as you know that you will rise like the phoenix in short order, with your leader’s enthusiastic assistance. Now, while others scratch their heads about whatever actually happened, you’ll know because you’ve been a part of securing the glorious administration of leadership of the man or woman who calls themselves your boss. As a result, you will move up fast. Oh, even faster if you gather together all documents pertaining to the incident in question. Sadly, Adlai Stevenson didn’t have it in him to do this. And this clouded his last years on Earth. He must have wondered how different things might have been if he submitted, at a moment of his choosing, all the private documents in question. Why, Mr. Julian Assange, the leader of Wikileaks, could have told him how sweet that is. Just watch your back. Dr. Jeffrey Lant is well known worldwide for his insight into corporate events, leadership, personnel, etc. He is the author of over 60 books, and over 1,000 articles on a wide variety of topics. He is known for telling it like it is. To get access to all of Dr. Lant’s many ideas, projects, programs, books, and materials, go to www.drjeffreylant.com. Don’t try to do all of this alone when you have such superior assistance available right now. YE” HAS COME AT LAST. She wasn’t up to Harvard standards, she was not a woman of education, not a woman of merit, and most important, NOKD, “Not our kind, dear.” As these words, written and implied, rolled out, I knew in my bones that come hell or high water, I would be present, in full regalia, to honor the lady and what I knew would be her message of hope, inspiration and empowerment. And so yesterday, on the unexpectedly hottest day of the year, I went back to Harvard, on the day of my own 43rd graduation anniversary… to show solidarity, support, good manners and discerning judgement. And no one cheered her more loudly and with greater sincerity than I did… for I recognized that this was not merely an event to honor a single woman, no matter how deserving of such honor. But far more important to honor the sisterhood and their gentle revolution, an epochal event that changed the world and liberated not just women but men, too, for the liberation of women has certainly meant the liberation of men, though not all such have recognized this yet. Before I go on I want to take this opportunity to introduce you to the principal players in yesterday’s production. First, there is Mr. Aime’ and Mrs. Mercedes Joseph, born in Haiti, two of the principal reasons why my life works so well and smoothly. I took them to Commencement to thank them, to show them an aspect of Americana they would not otherwise see, and, frankly, because it is easy to trip and fall amidst the undulations of such a huge crowd… and their support was very useful indeed. Drew Gilpin Faust, President of Harvard University, Lincoln Professor of History. Sandra Demson, ’58, distinguished attorney in Canada, veteran of the revolution. Diane Neal Emmons, Ed.M., an old friend rediscovered, another soldier for the cause, her weapons of choice her wit, ebullience, and an optimism that will not waver, despite the provocations life throws at each of us, delighting to see what we will make of them. Since I arrived at Harvard in the fall of 1969, I have passed through the great Class of 1877 Gate thousands of times. But when I passed through it yesterday I was patted down by a female security officer. It is a sign of our times, a blip that tells us the world has changed, and not for the better. Once inside a recollection from “Gone With The Wind” came to mind. It was at the beginning of the film, where the newly engaged couple, Ashley and Melanie, stand on the balcony of Twelve Oaks and look out at their world of grace, luxury and privilege, a world they love, threatened with destruction whether the South wins or not. I stood for a moment, just next to the president’s office in Massachusetts Hall and looked at the vibrant scene before me. It, too, is challenged, roiled by even positive change… I was determined to see, determined to remember what I saw this day and what was part of me: class marshals in top hat and cut-away; their female counterparts wearing bright red rosettes with bright smiles to match; academic gowns from every renowned and prestigious university on Earth; new graduates wearing the most desirable costume of all, their unflinching youth. They would shortly sing “Gaudeamus igitur, Juvenes dum sumus” (Let us rejoice while we are young.) They would not understand… but the alumni before them would… for the words, once just lyrics of a well-known song, gather their profound meaning with every passing year in an exercise we call wisdom and which we cannot approach unmoved. Every alumnus becomes perforce a guide when escorting guests to Commencement, and so, hobbling, I lead the Josephs to the statue of John Harvard, the Founder. Only it isn’t. There are no extant images of the man whose gift of books, lavish as all gifts to Harvard should be, launched the greatest educational establishment on Earth (1636). What to do? Improvise! And thus a suitably attractive young man of noble countenance from the class of 1884 was invited to pose for the famous statue by Daniel Chester French. It stands in the center of the Yard, the faceless Founder facing eternity in the body of flawless youth. Both have thereby been immortalized, and this is perhaps why one is advised to rub the shoe for luck… for seizing eternity is certainly worth the doing. This is something every Harvard student knows. When you talk of The President in Cambridge, you mean the President of Harvard. It was my privilege to share a few minutes conversation with the current occupant yesterday, Drew Gilpin Faust, president since 2007. An historian herself, she is a person of history; the first woman to lead Harvard. Let me tell you this: she is well and truly on her way to becoming one of the most respected and beloved leaders of this historic institution and thus one of the great benefactors of the Great Republic and the wider world beyond, for Harvard is universal now and forever more. In her remarks yesterday she drove home one essential point; that the impending massive cuts in federal research funding are short sighted, self destructive, ill advised in every way. Research is what gives us the improvements we desire; slicing any part of it gives us less. Does this make sense? President Faust will ensure Harvard’s clout is used to avoid this folly. And she has my support in doing so. Just as she will always have my support in any and all endeavors to strengthen the liberal arts and humanities, always the great beating heart of Harvard. There were just three seats left in about the fourth row, and I knew we should grab them. But first I needed a positive response to the question asked through the ages: Is this seat taken? And so I came to meet a new friend, Sandra Demson, Class of ’58. She had come to participate in the 55th Reunion of the Harvard and Radcliffe Classes of 1958. I introduced myself and in just a minute or two we were chatting like a house afire, discovering one person after another we knew and had in common. Harvard meetings are like that. However, the most important aspect of our conversation concerned my questions to Sandra about the differences she discerned in the situation of Radcliffe students in 1958 and the position of women undergraduates today. And here a pleasant afternoon’s smooth conversation became more than chat, an insight into history, something she wanted to tell… and I very much wanted to hear. You see, Sandra Demson, smart, attractive, charming, was part of the generation which placed every aspect and feature at the foot of Man… and lived to regret it, like so many other women who not only discovered father didn’t know best; they discovered that father knew hardly anything at all… and this made for many problems, ructions, and difficulties, especially when Man continued to insist upon a superiority he clearly did not possess. And so Sandra, like every “good woman” of her age and outlook learned to carry on, bite her tongue, and somehow keep the faith alive, that better days, and lasting love, too, would come to her. And, in due course, “this too shall pass” passed… And God granted her marital love, peace, and the easy, “woman of the world” manners which we have all erred in not insisting our young successors should have and which she graciously shared with me on this sweltering day. It was Sandra Demson who looked at Oprah and said, “She’s nervous. She’s trembling”… No wonder. A poor black girl from the Deep South,had by dint of unceasing work, determination and an attitude of “must” not just “can” do had scaled the heights into the very citadel of American prestige. There she was, physically smaller than her outsized television presence, quivering just a bit but the crowed roared for her… and so the lady of embracements, hugs and love, was soon awash in the huzzas which must have been heard blocks away. In a very real sense, Oprah Winfrey had come home, and she was greeted accordingly. When the tumult ebbed a bit, Oprah began. Soon, just in passing, she mentioned a tune she loved. I looked it up when I got home and immediately understood her better as well as why she’d referenced it, holding it close, a security blanket. It is “We’ll understand it better bye and bye”. Written by Charles Albert Tindley (1851-1933), an ex-slave and “the Father of Gospel Music”, it is a rousing, barn stormer of a song, the lyrical equivalent of Oprah herself. Go now to any search engine and listen carefully…”We are tossed and driven/ on the restless sea of time… We will understand it better bye and bye.” I prefer the inimitable version by Mahalia Jackson. Listening to this mistress of godly soul, you can believe, deep in your heart, that better times will come as they came to Oprah Winfrey. My day was, I thought, over and completely successful. Aime’ and Mercedes Joseph had given support. President Faust impressed and reassured. Sandra Demson gave charm and friendship. Oprah gave the formula not merely for success, but how to conquer failure. It was enough, more than enough, but there was more…. Oprah Winfrey turned me on to “Understand It Better Bye and Bye.” It is easy to see why she liked it. It is upbeat, toe-tapping, praise God music, written by the Rev. Dr. Charles Albert Tindley (1851-1933). You’ll enjoy it. Play it whenever the world and you are at odds. Author’s program note. Have you ever been to South Boston’s St. Patrick’s Day parade? It is at the best of times a pitiable thing, ramshackle, disorganized, still smelling of the mother load that Billy O’Sullivan barfed on Monseigneur Murray last year as he bent down to bless the laddie, age 38 and unemployed. That’s a comfort to his eminence, although his lawyers told him to pony up $60,000 for each of them because he loved them not wisely but too well. Hallelujah. And, yes, they’ll be marching in the parade, wearing their new store-bought duds. They even chipped in for something for Billy since the ones he wore last year are encrusted with dull green puke and stink to high Heaven. Such a serenade it will be. It’s sad most of the boys singing are missing their front teeth, a combination of hockey pucks gone astray and punches from the O’Malley’s. In truth they shouldn’t have called their cousin Fiona a whore, though if the truth be told… Still, the Christian way is to say nothing and hope that Father Pat can give her some good solid advice before this baby ends up in the Home for Little Wanderers like her last one. Who finally admitted paternity in that case anyway? Oh, yes, now I remember. That would be Jimmy Hennessey, who set the record for most AWOL days in the USMC. It was said, but never proved, that he had girls in every port. He told me right on this very porch he always kept the lights out when he had visitors of the female persuasion so they couldn’t see all his tattoos and figure out where they stood in the pecking order. The first one saying “Rosita” was the biggest and as he added the girlies he cut the size. I shouldn’t tell you where the most recent was engraved… he said he could only fess up if he had another brew or two… I gave him the bottles of course, not to see mind, but only out of courtesy. I looked… then I had to look away. It was D-I-S-G-U-S-T-I-N-G .He told me he’d be marching in the parade… then laughed and showed me his tattered underwear. “I’m charging 50 cents per view.” He would. (OMG how I love my neighborhood and all the good people within it… they make our parade the best ever and everywhere). Old French Proverb, hence unknown in the Emerald Isle. The old guard obstructs, blocks, embarrasses, dies. But it never thinks and never surrenders. Their’s is the most foolish consistency of the littlest minds. For over 20 years now the people of Southie have done everything they could to keep the wrong sort of people as far away from them and their civic endeavors as possible. They wanted a parade that showcased their adamant (Roman Catholic) family values, their local and vocal celebration and veneration of St. Patrick, Patron Saint of Ireland, and the evacuation of the British fleet and army from Boston in 1776. These disparate factors come together once every year to create a humdinger of an event… bigger and better every single year. And still pure as the driven snow. No preverts, if you catch my meaning. Of course my little signs have helped a lot, “No preverts need apply!” I’ve dished out at least 100 but only to my lace-curtained friends and neighbors. They cost good money after all. Brother Thomas Dalton’s true colors. This year the forces of Sodom and Gomorrah made a concerted attack on the parade. Since last year at this time they had gained a very significant supporter in his newly elected honor Mayor Martin Walsh. Walsh is as Irish as they get but he knows that preverts walk nowadays in every city’s parade but two, and he wants New York to be the last one standing, habited in shame and prejudice. Thus, he made a major effort to get them a place and bury the problem. For an instant, but only for an instant, his round-the-clock endeavors paid off. The parade organizers at The South Boston Allied War Veterans Council, with their personal pitbull John J. “Wacko” Hurley in the vanguard, agreed to let gays and lesbians march, so long as they wore no identification, no badges, no tell-tale insignia. It was insulting, of course, discriminatory, and demeaning. Nobody liked this compromise which may have been the surest indicator that it was the best that could be achieved just now. Unfortunately the bigot brigade, which never slept during these tumultuous negotiations, immediately sent in one of their dimmest bulbs, Bro’. Thomas Dalton, Principal of the Immaculate Heart of Mary school in Harvard, Massachusetts. He pulled the school’s marching band out of the parade saying he couldn’t allow his petted darlings within a country mile of anyone “condoning the homosexual lifestyle.” Thus, with a whiff of the Inquisition this uneducated educator made his unenlightened opinion known… and the agreement fell apart, disgust and finger-pointing from every side. Was that completely unacceptable outcome absolutely necessary? Certainly not! As an internationally known management consultant, I offer a better way, a thinking-outside-the-box way, a way that will solve this pesky problem… with the extra advantage that it leaves Manhattan and its biased practices in the trash. Delicious. Dr. Lant’s idea for solving this problem now. We have all wasted enough ink on this situation. Let’s solve it now, people. “Wacko” Hurley and company would prefer no homosexuals walking the parade route. But given enough mayoral arm twisting, they would probably re-accept the deal they originally offered and then withdrew. Gay rights organizations understandably want total equality, absolutely no hint of condescension and moral disapproval. Political realities being what they are, they’ll have to hold their noses and take the original offer with as much grace as possible… always remembering that this grand presentation I’m here recommending ensures maximum worldwide publicity and an eye-opening response from the recalcitrant and mulish organizers. Six examples of pulchritudinous beefcake should follow, dressed in green jock straps, broad green ribbons, and leprechaun hats with pointed ears. Nothing else except for “Erin Go Bragh” artfully engraved in bright green on the right buttock. These boys, tap dancing, will from time to time open like shamrocks at sunrise… only to reveal this scenario. “And I’ll be here in sunshine or in shadow”/Oh, Danny boy… I love you so!” Given what Billy’s packin’, it’s easy to see why… and there won’t be a dry eye in the house, which is just as it should be. “Danny Boy” is one of the most famous and affecting songs in the world. It is a ballad written by English songwriter Frederic Weatherly (1913). It is usually set to the Irish tune of the “Londonderry Air.” It was recorded in 1915 by the celebrated vocalist Ernestine Schumann-Heink who gave its simple words their soaring majesty. Go now to any search engine and find the version you prefer from so many notable alternatives. Since its release people have argued about its meaning. Is it a parent singing for a child off to the Great War with its sickening casualty lists? Or is it about another leaving the profound beauty of Ireland, so easy to admire and break your heart? What matter? It is a song of love, however given, wherever needed. As such one man should indeed sing it to another whenever his love is ardent and true, whether he be straight, gay, or anything else. 10,000 (WO)MEN OF HARVARD. OPRAH WINFREY AT COMMENCEMENT, MAY 30, 2013 AND I AM PROUD TO BE THERE FOR “BYE AND BYE” HAS COME AT LAST. VOTING… THE GREAT REPUBLIC, ITS ELECTORAL CIRCUSES, AND ME. I want you to know how jubilant I am, at 70, to have yet another chance to determine the fate of the greatest nation on Earth. I have followed, since 1956, every triumph, every embarrassment, every great step, and every one best left forgotten. I have enjoyed and exercised every American citizen’s right to criticize, excoriate, ridicule, belittle, and mock the great affairs of the greatest nation. I have seen the littlest and most contemptible of my neighbors say things which in ancient days would have caused a duel to the death. And yet here, on hearing such matters derided and held up for public censure, no one has shrugged a shoulder, much less batted an eye. We are the country which is a sewer for every contemptible, banal, dangerous, and downright stupid notion that has ever existed in the annals of our species. Now, I invite you to my little history involving as it does one native son’s involvement with the process that still remains the last best hope for humankind, and the opportunity for what we can never forget, life, liberty, and the pursuit of happiness. I come from a voting family. Its members would no more miss an election than they would spit in Church. Next to baseball, elections were the affairs most discussed, harangued, examined. Every election produced opinions by the bushel, discussions that could quickly turn rancorous, or worse. People were held contemptible if they did not exercise their constitutional privilege, and each time someone said “No, no I’m not voting”, they were reminded, and often too, how men and women just like them had died so that some bozo could say “No, no I’m not voting”. Contempt was heavy in the air, and was called upon whenever necessary to remind people who were citizens that that citizenship entitled them to exercise the suffrage, that is to say, vote. I have always found this jejune opinion particularly useless. A system of governance like ours, with thousands of electoral posts to fill, will not always, or perhaps even ever, rise to greatness, perhaps not even one person of consequence, ideas, stature, and the capacity to cover his errors better than others. This is a system of the people, by the people, for the people, and if these particular people do not rise to the high standards of brilliance, why then, sir or madam, neither would you. Democracy, voting, gives us the opportunity yet again to prove that we can be better than we are, to prove that our system will continue even when so many of its members do nothing but censure, denounce, disparage, denigrate, and attack it. I have paid close attention to this system since 1956, when aged 8, such names as Estes Kefauver, John Sparkman, and J. Lister Hill crackled the radio, and there was a magic, even a grandeur about how the people and their government came together. ut the burden was lightened by these great words booming across the convention, the nation, and the world: “The great state of Alabama casts…”, for these were the salad days of a system that told the world how united we are in our processes, even if we disdain (some of) the candidates who represent them. Thus, the summer passed one wheelbarrow load after another, good soil of the great state of Illinois. We were especially proud that our state was frequently cited on the radio because our former governor, Adlai E. Stevenson, was in nomination again, after having won the nomination in 1952, and then was crushed by America’s hero, Dwight David Eisenhower. Estes Kefauver, the Senator from Tennessee who wore a coonskin cap without (I think) too much derision, told the world that Adlai Stevenson was weak, soft on Communism, and the most terrible insult imaginable, an egghead, a designation which Governor Stevenson wore like a red badge of courage. Kefauver was crushed, but was given the Vice Presidential nomination by Stevenson. Young Senator John F. Kennedy lost by a hair, that Vice Presidential slot. Winning it would have been a disaster so early in his career. This Tennessean who could never by any stretch of the imagination have been called an Intellectual, was proud of his mangled grammar, and wanted the world to see that we were not only a nation disdaining intellectuals, and with Estes Kefauver, never would be. And thus the state banner of Tennessee, which represented both John Scopes, accused of teaching evolution in the notorious Scopes Monkey Trial (1925) forbidding the teaching of evolution, and the majority of Tennesseans, who believed in the Good Book, and nothing else, was released into the aisles of the convention. It was thrilling. It was the people in action. These people were working for us. We were not like the people of Hungary, or the great land we called Red China, or all the barbarians of Uganda, and so on through the catalog of horrors called nations. I was a boy who could spend his summer helping my father (however reluctantly), pestering his brother, and tormenting his cat, without a commissar calling to pressure us, or a fascist dictating our thoughts, or the military forces of any country intervening in our most trivial and intimate affairs. I was a citizen of the Great Republic, and I listened accordingly, for though Governor Stevenson may not be my candidate, or even Dwight David Eisenhower for that matter, I had the ability and the great honor and privilege to help build a nation as I wanted to, as all my fellow citizens wanted to do. This was the greatest honor of all. This year, I shall go to the Baldwin School on Sacramento Street to continue my partnership with the Great Republic. I am not as spry this year as before. I may even use my walker, since an article in the Boston Globe suggested people with walkers go to the head of the line. However, I have no desire to expedite the process. I cherish its every arcane and esoteric aspect. There is no one else in my house to say “Don’t forget, today is voting day!” All those who used to say this to me have gone before. I shall be asked my name at the polling booth even though the lady behind the counter knows who it is. And I approve her unwillingness to fail to follow even one direction. She’ll hand me my ballot; we still use paper ballots in Cambridge, Massachusetts. I shall take up the pencil, look over the names, including the ones at the bottom of the ballot, which no one ever knows. I am happy, proud, tenacious, and curious. And as I go out into the chilled air of a Massachusetts Fall, I mentally tip my hat to the great founders of the Great Republic, for we have been in partnership this long while, and I salute you, though I be from time to time censorious, angry, petulant, and dismissive. I’m allowed to so feel and so act. I have voted, and thereby continued my essential relationship with my government, and my nation. God bless America, and may her staunch citizens live on whether they criticize or whether they do not, for this is the legacy and the reason for our greatness, and why the vote you cast is a measure of honor and hope. Certain papers were waiting for me, and an admonition. The incident that I was researching for my book on royal victorian pageantry (the book which became in due course “Insubstantial Pageant: Ceremony & Confusion at Queen Victoria’s Court”), had a very human incident that had never been published before but fit perfectly into my book.